It is the user responiblility to write their own wrapper functions for their own use cases. pgRouting functions provide a “low-level” interface to algorithms and return ordered identifiers rather than routes with geometries. Creating a complex queries, views or wrapper functions, can be used to connect to a high level application. The data may come from a source that is not OpenStreetMap. The column names may be in other language than English. In this chapter we will look at some common wrappers examples. The following exercises only cover shortest path queries with a single route result. For this chapter, all the examples will return a human readable geometry for analysis, except Exercise 12. The vehicle is going from vertex 13224 to vertex 6549. The vehicle’s cost in this case will be in seconds. Include the geometry of the path in human readable form. 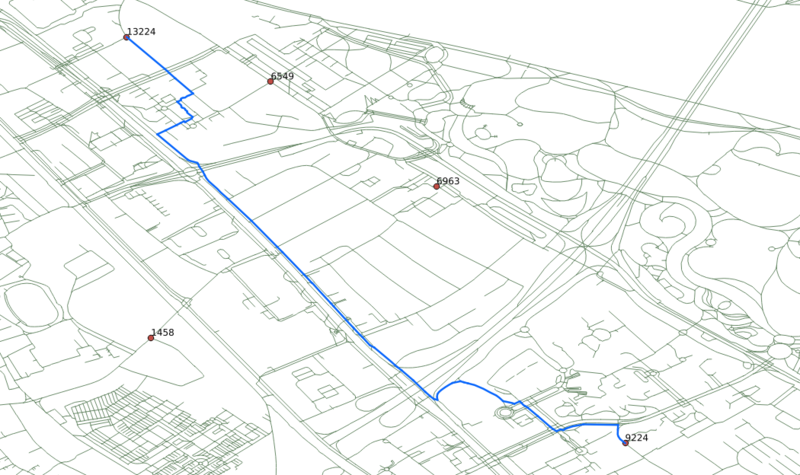 The last record of the query doesn’t contain a geometry value since the shortest path function returns -1 for the last record to indicate the end of the route. Include the geometry of the path in default binary format. The first point of the segment must “match” with the last point of the previous segment. WITH provides a way to write auxiliary statements for use in larger queries. It can be thought of as defining temporary tables that exist just for one query. The vehicle is going from vertex 33180347 to vertex 253908904. Start and end vertex are given with their osm_id. Create a view of the network area (bounding box). Use my_area for the network selection. The vehicle wants to go from vertex 33180347 to vertex 253908904. The following function simplifies (and sets default values) when it calls the shortest path Dijkstra function. Need to make many similar queries. Should work for any given area. Same conditions as in the previous exercise apply. Additionally provide information for orientation (heading).